Business establishments, in particular restaurants in Montego Bay are being warned to abide by the public health laws to avoid rat infestation, or face the courts and possibly lose their operating permits. Over the past two years, the St James Public Health Department has been on a relentless drive against rat infestation in the city, but the level of cooperation is less than desired. It has now reached the stage where restaurant operators will have to face both the health department and the National Solid Waste Management Authority (NSWMA) as they lay down the gauntlet. The soft approach was taken last week when the NSWMA encountered a serious garbage problem at the Montego Bay Transport Centre. During collection at the transport centre on Monday, January 28, the NSWMA observed that it had been overrun with rodents and contacted the public health chief. On visiting the following day, Mr. Wallace met with representatives of the lessee and following discussion, notice was served for a rodent control programme to be initiated. The health department stipulated that “a pest controller must be hired by them to effect remedial measures.” Three truckloads of garbage were removed from the facility subsequently. “It’s safe to say that the property has been brought to minimum public health standards,” he said. Mr. Wallace said having gone there himself last Friday, he was satisfied that it had been thoroughly cleaned and up to yesterday, he was signing applications for the renewal of licenses for the 14 vendors operating in the transport centre. But while the transport centre now has a clean bill of health, the adjoining People’s Arcade complex continues to be of major concern. “Whereas the lessee (at the transport centre) would have brought back his property to public health standards, my concern goes to the People’s Arcade that we have been having problems over the years with,” said the public health chief. 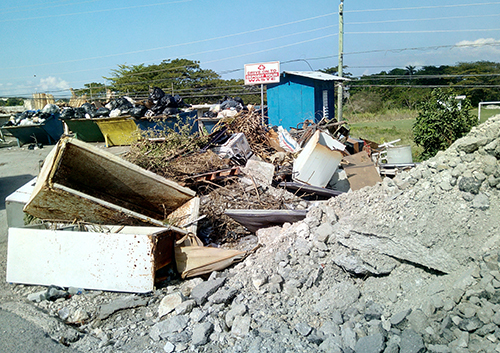 The shops were built by the St James Parish Council but the land is owned by the Jamaica Railway Corporation, which has been making failed attempts to recover its property for several years. The gravity of this problem is that, “right now, 95 percent of that facility is now domestic”, with what was intended to be shops operated by persons taken off the streets of the city, converted into a beehive of living quarters in which children are being raised. Meanwhile, the rodent eradication programme, initiated in 2017, has entered a third phase as rats have been detected in the area of Dr Jimmy Cliff Boulevard along the Hip Strip “where at 1:00 o’clock in the day, you can see rats running up and down, which shows you that we have a high incidence there because rodents are normally nocturnal animals,” said Mr. Wallace. A request has been made to the Tourism Enhancement Fund for further assistance and this morning, a programme costing $7.2 million will be presented to the chairman.